International investors believe the opportunity to develop a robust affordable housing market in Vietnam has great potential. Tomaso Andreatta, chair of the Vietnam Business Forum (VBF), said there were still opportunities in the real estate market, especially in the segment for medium-income earners. He said the economy is witnessing rapid development. With income and accumulated money on the rise, people are investing more in land and houses. The real estate market is attracting foreign investors because the cost in Vietnam is very competitive. Products with affordable prices have great long-term potential for development. Jones Lang LaSalle (JLL) agrees that affordable apartments are a stable market segment, because the demand is always high. A survey by JLL found that in 2016-2018, the apartment price in Vietnam increased by 7 percent per annum, while affordable apartments saw a sharper price increase – 10 percent per annum, or 30 percent in the last three years. Though low-cost apartment prices are on the rise, this is the busiest market segment thanks to demand. Even when the real estate market faces uncertainties or the market cools down unexpectedly, the liquidity of affordable products will be stable. CBRE Southeast Asia CEO Vikram Kohli said that Vietnam is mentioned in all realtors’ discussions about emerging and dynamic markets thanks to the country’s high economic growth rate and the rapid expansion of the middle class. These factors are creating high demand in the housing segment that targets medium-income earners and the wealthy. 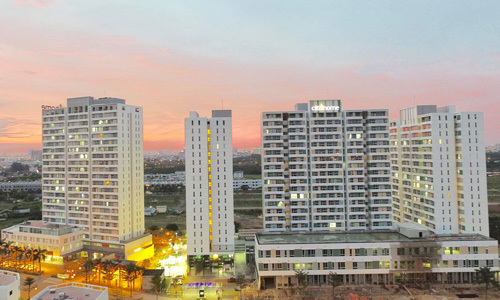 Foreign capital in Vietnam’s real estate market has been increasing in the last three years. Asian investors from Singapore, Japan and South Korea are focusing on projects in the central area of HCM City and land plots located near future subway stations. Singaporeans, Hong Kong and Taiwanese investors are also showing special interest in apartments and serviced apartments in the two market segments, accounting for 75 percent of clients who buy properties for lease. A report found that foreign clients comprise 50 percent of total housing project transfer deals, a figure which shows that foreign investors not only want to expand business, but also commit to long-term investment in Vietnam. Kohli said there were ‘bass notes’ in the real estate market in 2015-2018 and some signs of a slowdown, but he believes the correction is a positive sign for the long term. Vietnam's real estate sector attracted $5.5 billion worth of FDI in the first half of 2018.